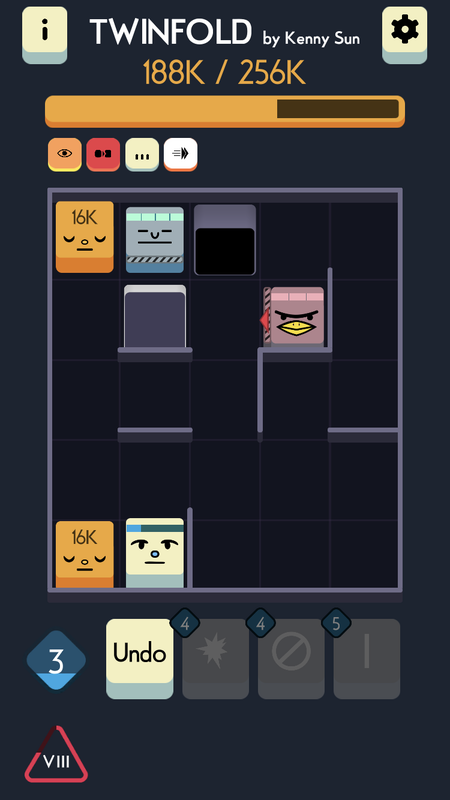 I’m a big fan of swipe-based roguelikes and high-score chasers that feel perfectly designed to play on an iPhone. It’s amazing how innovative mobile developers can get using swipes as the primary input from a player. I don’t know if Threes! was the first game to have the whole board shift with each swipe, all pieces moving in the same direction. But since then, many developers have incorporated that mechanic into their games, with varying degrees of success. 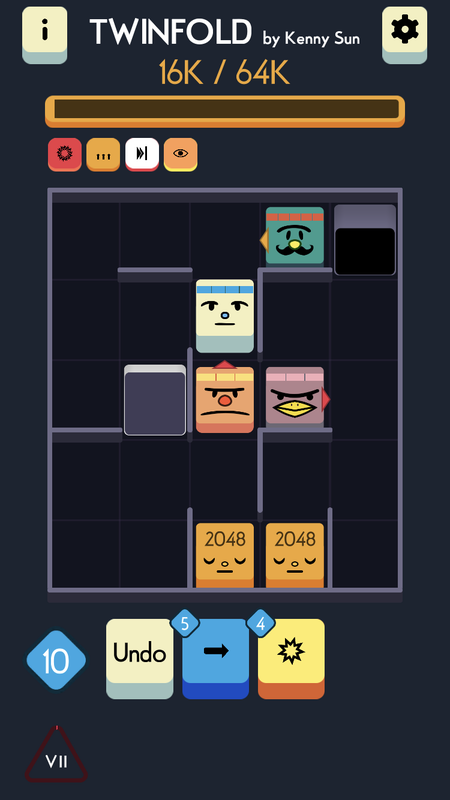 Kenny Sun’s latest project, Twinfold, doesn’t shy away from its inspiration of Threes! and Imbroglio, and it doesn’t need to, because it stands firm all on its own. Playing it feels familiar, like a word on the tip of your tongue, but new and exciting at the same time. It’s like meeting a stranger and hitting it off because it seems like you’ve known each other your whole life. 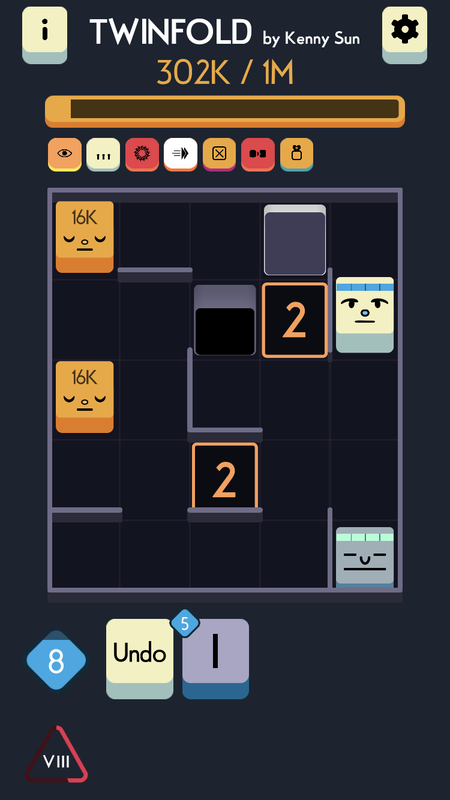 In Twinfold, you play as a simple square, just going about your business combining and chomping on numbered idols. Why are you doing this? Why, to get bigger and stronger, of course! Each time you swipe your screen, all pieces will move in that direction. If there are two numbered pieces on the board and they bump into each other, they’ll merge into one piece that’s twice the number that was on each individual. At that point, the whole board will change completely, from its walls to its pits, and any other obstacles. Your piece, the number piece, and any enemies on the board stay where they are and new spawn spots for enemies start their countdown. A second number piece with the same number as the first will also spawn somewhere randomly. Each time the board changes, its procedurally generated, so you’re unlikely to see the same exact layout twice. But you need to pay close attention arm get the lay of the land, because if you bump into any walls or enemies, you take damage. Thankfully, enemies also take damage from walls, so you can use that to your advantage. If you manage to keep merging those two number pieces without getting either one eaten by you or the enemies, or letting it fall into a pit, the number will keep doubling and you can end up with an insanely high number on those pieces. That’s the goal, but it’s easier said than done. The good news is, if you eat one of those pieces, you’ll gain that number of experience. So if you eat a 64 tile, you’ll gain 64 experience points. If you eat a 1024 tile, that’s how much experience you earn. The orange bar at the top tells you how many points you need to reach the next level, and it doubles as your overall score. When you do manage to level up, you’ll get to pick one of several skills. These can either be passive or active. A passive skill changes something permanently. For instance, you might get one extra max health, or enemies might take extra damage when running into walls. One of my favorites was one that caused enemies to die instantly if they ate a number piece. It was very useful when I was surrounded by enemies. An active skill, on the other hand, can only be used if you have enough mana, which you earn by killing enemies. These skills stay with you the whole game, so you don’t need to worry about using them up. One allows you to build a wall anywhere on the board, while another delays all enemy spawns by one turn. There are forty total skills you can come across, so that leaves quite a bit of room for players to find their favorite mix. The catch is, when you eat a number piece, no new number piece spawns until the other one is gone as well. And when new ones do spawn, they’re half the value of the ones you ate. So you want that experience in order to gain more skills, but at the same time, you want the numbers to keep growing. So there’s a lot of risk/reward dynamic here. Adding to that, you sometimes might need to inflict self damage in order to get rid of an enemy or merge the number pieces. 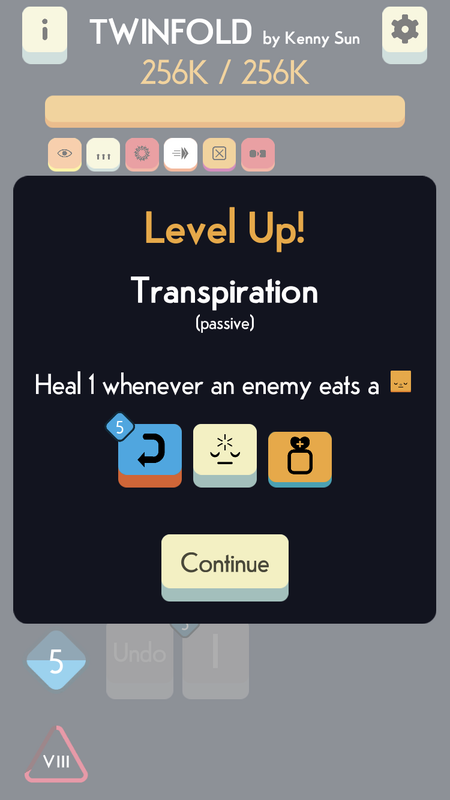 Since you heal a little each time you eat, and fully heal when you level up, you can sometimes afford to purposely run into a wall. There’s a ton of depth to the game, as each move you make can have a ripple effect. For instance, the enemies have arrows on them showing which direction they’ll move on the next turn. If you point them directly at a wall, they’ll run into it because they’re that committed to their decision. But there are different enemy types with different abilities, some even able to go through walls or float over pits. I could probably talk about all the little details forever, but the point is that there is just so much to take into account and it makes each new game exciting. Even though I completely sucked at Twinfold at first, it finally clicked and I got thoroughly engrossed as my scores started climbing into the hundreds of thousands. I still have a long way to go, as the developer’s high score has too many numbers to count. I had to ask him if it was real because for any other game, it looks like a hacked score. So I’m completely on board now and keep going back for “one more round” to try and beat my high score. There is an undo button if you mess up, making a careless oversight less painful, but there are two separate leaderboards. So if you do use an undo, know that everyone will be aware of it. It’s still impressive, but a little less so. On top of that, some points are deducted from your score for each undo utilized. So you still want to use them sparingly. I’m thoroughly impressed with Twinfold and how all the pieces work together to make a nail-biting turn-based experience. My only issue with it is that it’s somewhat luck-based due to its procedurally generated levels. I actually have this issue with a lot of similar games, though, where you level up and get to choose from certain upgrades or skills. You tend to find your favorites and then if you don’t get them, you feel like you’re at a disadvantage. I guess that’s all part of the challenge of these types of games, though. You need to learn how to make do with the hand you’re dealt. It’s fine, but it still sometimes feels like I’m waiting for that perfect mix of skills to happen again so I can get back in my groove. If you’re looking for a new one-handed obsession with oodles and oodles of depth, well, this game has it tenfold. It does have a bit of a learning curve and some luck to mitigate, but it’s so, so satisfying when you get deep into a game and it just flows. It feels so good to trick enemies into killing themselves. I don’t know if that makes me sadistic, but I taunted them quite a bit for leaping to their deaths. Apart from occasionally being dealt a bad hand, Twinfold is a masterpiece in game design and if you have any interest at all in these types of games, you’d be crazy not to play it. So grab the game here and start smashing enemies into walls. And if you need help figuring out any of the mechanics or enemies, try my strategy guide here.